Sony Computer Entertainment has announced today that they are selling all their 9,520,000 Square Enix shares to a company called SMBC Nikko Securities. This will generate an income of 15.3 billion yen, around $ 150 million USD / € 108 million which will be marked down Sony's financial report for the year ending 31st March 2015. Sony is lately in severe financial weather and this is a financial boost for the company. This marks the seperation of a long partnership that resulted in a strong presence of the Final Fantasy series on PlayStation hardware over the years. What the exact reason is for the sale is unknown. 17-04 Update: Sale price was incorrect and has been updated after Sony's announcement. Final Fantasy XIV: A Realm Reborn PS4 out now! Today, Final Fantasy XIV: A Realm Reborn is worldwide available for PlayStation 4! Those who had pre-ordered the game could already play in the last beta since last Friday (11 April). A big difference from the PlayStation 3 version is that the game is now rendered in 1080p and uses the same layout and interface as the PC version. Also it has support for remote play on the PlayStation Vita. PlayStation 3 players who also have a PlayStation 4 can upgrade their account to the PlayStation 4 version for free. Only once this process has been done, there's no going back! This offer lasts till 31 December 2014. An eloquent display case featuring the flower that grows from Zero’s eye. This beautifully illustrated 160 page prequel story to Drakengard 3 (available in English language only) contains a collection of short stories written from the perspectives of each character. Downloadable tokens for the Ciam costume, an additional level where you play as One, Zero’s sister, and a Giant Baby Hat (yes, an enormous baby’s head for your dragon, Mikhail). A CD containing a selection of mesmerising tracks from the game’s original soundtrack, composed by Keiichi Okabe (who also created the score for Nier). A collectable double sided poster only available in the Collector’s Edition of Drakengard 3. While there won’t be a physical disc version of the Drakengard 3 for Europe and PAL territories, a download token will be included inside the box which you can redeem on the PlayStation Store. Experience the game in its original audio with a download token for the original Japanese voice acting! This DLC will also be available for non-CE owners. 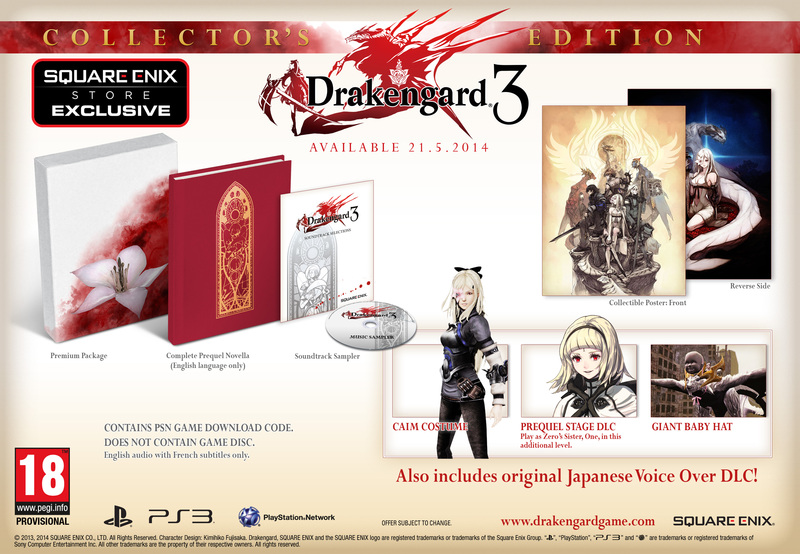 It was earlier announced that Europe won't be getting a physical copy of Drakengard 3. So why this Collector's Edition for a lot of money (if you ask me) with a download voucher? We, fans want a physical copy.